I’ve got another spectacular book giveaway for you Dear Readers, a book perfect for every Dracula fan! We’re offering one lucky winner a copy the critically acclaimed In the Footsteps of Dracula: A Personal Journey and Travel Guide by Steven P. Unger. Containing not only travel information, but historical accounts as well, this fantastic book was ranked above both National Geographic’s guide and Lonely Planet’s guide in a survey of the World’s Best Romania & Moldova Travel Guides, which is highly impressive. For the armchair traveler, pictures and descriptions, in memoir form, of every site in England and Romania that is closely related to either Bram Stoker’s fictional Count Dracula or his historical counterpart, Prince Vlad Dracula the Impaler. A thorough history based on original research and face-to-face interviews with experts—such as the Man in Black of Whitby, England—of how the novel Dracula came into being, and almost never happened. The true life story of Vlad the Impaler, connecting his lineage for the first time in print to the Brotherhood of the Wolf, which had already survived for two thousand years when Prince Vlad was born in 1431. 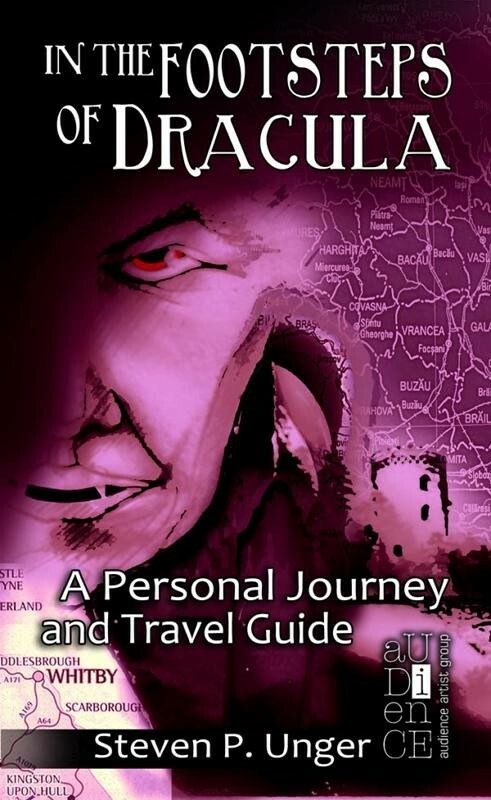 For the independent traveler who would leave his armchair for the Great Unknown, a Practical Guide to the Dracula Trail, including a complete Sample Itinerary with recommendations for lodging and detailed instructions on traveling to each British or Romanian Dracula-related town or site—at a small fraction of the cost of Western European-only travel. Also in the Practical Guide are sections on money; recommended reading; modes of transportation; security and health; internet access, shopping, and cable TV; and alternatives to independent travel. A Rare Photo of a Wolf-Dragon, the Original Source of the Name “Dracula,” Carved Within the Ruins of a Prehistoric Dacian Temple in Transylvania; and much, much more! I am thrilled to give away a copy of In the Footsteps of Dracula: A Personal Journey and Travel Guide, this is most definitely one of the most impressive vampire books I have come across in a long time. To enter into the giveaway all you have to do is send an email titled “Dracula” to contest@darkness.com telling me why you want the book. On February 15, 2011 I will pick one winner for a copy of In the Footsteps of Dracula. Added note: the winner has 48 hours to respond, if they don’t within that time then the book goes to someone else, so make sure to check your email on the 15th! Congrats to Damon for winning not only a signed copy of In the Footsteps of Dracula, but a signed print as well! Yay!